Your aircraft passenger seats are among the first things passengers see upon boarding your airplane. Not only do they make a first impression, they’re where your passengers will spend the majority of their time aboard your plane. If the seats are worn and uncomfortable, passengers are more likely to have a less enjoyable in-flight experience. At Aero Marine Interior, Inc., we’re experts at reupholstering aircraft passenger seats as well as repairing airplane passenger seat covers. We know you want your aircraft interior to be pristine, and our expert aircraft interior technicians and seamstresses are prepared to make your passenger seats look and function like new. Our experienced interior technicians welcome you and your aircraft to our Florida workshop. Whether you’re interested in having your aircraft passenger seat covers repaired or entirely reupholstered, we offer top-quality services in a timely manner. First, we’ll examine the seats in your aircraft, then we’ll assess the parts and services you’ll need. Damaged seats will be stripped and cleaned. Then we’ll provide new cushion foam, new plastic trim and new covers as necessary. We’ll return your seats to your aircraft in like-new condition. It doesn’t matter if they’re traveling for business or pleasure, the passengers on your aircraft need to be comfortable. When we’re finished repairing your aircraft passenger seats, your passengers will not only experience enhanced comfort, they’ll enjoy a superior overall flight experience with less fatigue upon arrival at their destination. Our aircraft passenger seat reupholster service ensures the interior of your aircraft will look like new, providing a more pleasant experience for everyone who boards your plane. When you take advantage of our Aero Marine Interior, Inc. aircraft passenger seat services, you know you’re getting the industry’s highest-quality materials. Our aircraft interior technicians will help you choose upholstery fabrics that are most comfortable for your passengers, yet durable enough to withstand use year after year. Your passengers will notice a difference in the look as well as the feel of your aircraft passenger seats. Aero Marine Interior, Inc. employs the top aircraft interior technicians and seamstresses in Florida to reupholster aircraft passenger seats. They’re eager to help you provide your passengers with a more enjoyable in-flight experience. We offer the most trusted aircraft refurbishment services in a timely manner and with affordable pricing. 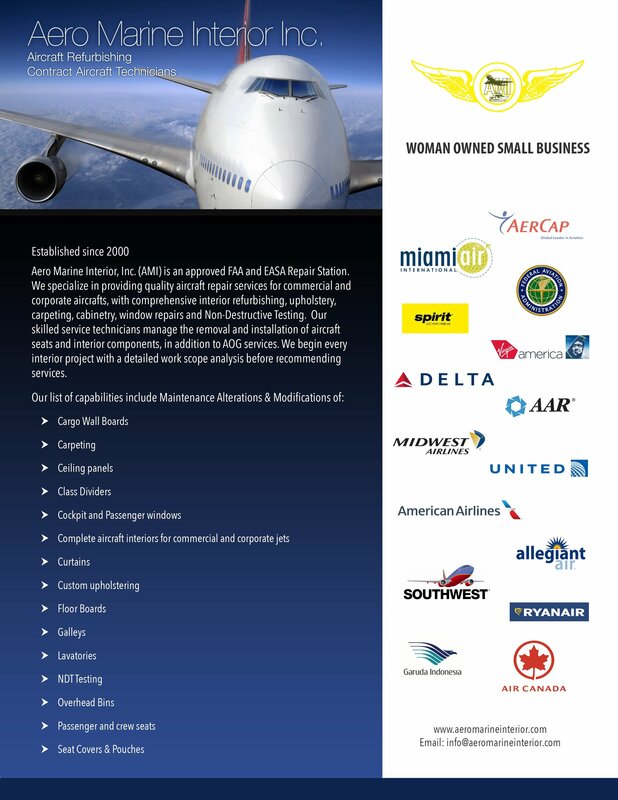 Call us or fill out our short online contact form to start the process of upgrading your aircraft passenger seats today.